Caitlyn de Beer: 10 ways to keep perspective!! 10 ways to keep perspective!! Like balance, perspective is something we all hope to maintain, but often stumble in our attempts at this.. It's so easy to get sucked into a situation, a job, a lifestyle. It's so easy to get lost in the day-to-day tasks and to forget the bigger picture. It's so easy to forfeit our vision, for something a bit more tangible, even if it's 'just for today'. Its so easy to let go of perspective and to replace it with immediate gratification. 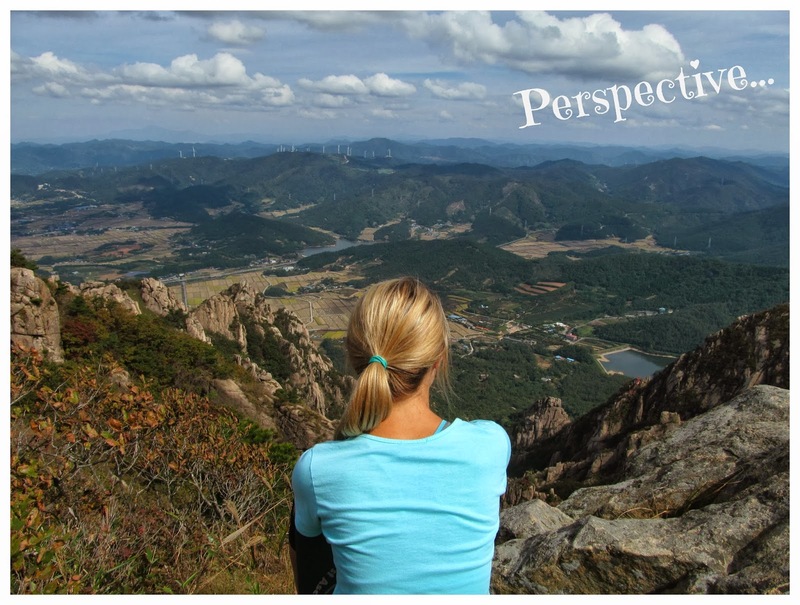 This past weekend held two significant eye-openers for me, in terms of perspective. I've always loved hiking. The adrenalin, sweat and endorphins all play their part in this love, but one of the things I love most about summiting a mountain, is perspective. On Saturday, when we reached the summit of Wolchusan (in Korea), I got a feeling that is so far from foreign to me, yet still as refreshing as ever. Looking down on the town below, so small and yet encompassing thousands of lives, dreams, fears and joys, does something to ones soul. Being above it all, outside of it all, helps you to separate yourself from the worries down there and view them, from up here. Here, it is safe, there is no one to hurt you, no fear to overwhelm you. Here, it's ok to forget, forgive, to cherish and to celebrate. Here it's easy to separate yourself from daily stresses and to focus instead on the beauty that surrounds you. Here, it's easy to breathe! Yesterday, I watched a 'space-type' movie (usually not my thing) but there were parts of this movie that took my little hiking-perspective theory and gave it wings to fly!! I watched through the camera lens, as earth became a small blue and white ball, and I was once again reminded of how far 'perspective' can take us. Seeing the world from the top of a mountain is one thing, but seeing it from space...well that's a whole 'nother level of perceptive. From there it's not just easy to forgive and forget, it's easy to let go. It's easy to see the bigger picture, earth as a whole. Your day becomes more than just to-do lists, it becomes mankind working together to maintain and protect this beautiful blue & white ball that we call 'home'. I understand that life can engulf you, it can swallow you and with no time to think, you find yourself on a downward spiral. What I'm here to remind you of today, is that perspective can, with the blink of an eye, pull you out of this dark space and into the light. Perspective helps us to become grateful again, it helps us see the light at the end of the tunnel, it helps us take our eyes off ourselves, and to see the world or a situation for what it is. Perspective requires from us, to remove yourself from all that life 'is' right now, and to breathe. Perspective is a beautiful thing...and you will likely discover that the space that provides you with perspective, will often be a safe space for you. A space where you can heal, where you can be real. A space where no one can hurt you, a space where just being you, is enough. In my husband and my journey in making a recent big life decision, we came face-to-face with the attraction of putting down roots where it is safe, where you are free from criticism and rejection, where responsibility is fleeting...but what we realized, is that mountains are for climbing, not for dwelling. Yes, life brings with it challenges, hurt and burdens to carry, all things that our 'safe spaces' protect us from, but life is also full of joys, relationships, dreams and successes all of which require you to live in the present, to be here, now!! What we have learnt is that to embrace this life full force we need to make mistakes, to dream, to build relationships, to take on responsibility...but all the while remembering the mountain. Remembering that perspective isn't only a momentary gift, it is essential in living a healthy balanced life.